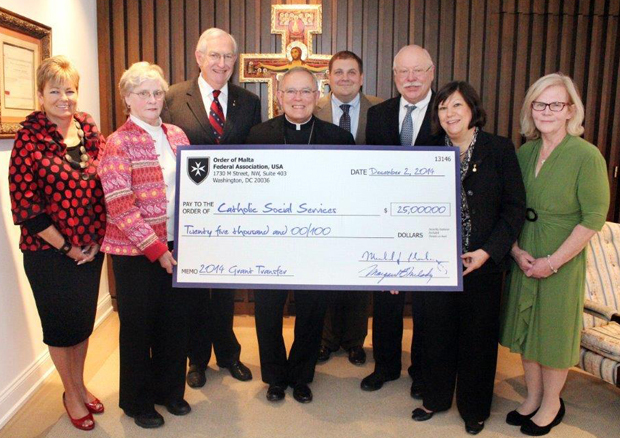 The Knights and Dames of Malta present Archbishop Charles Chaput (center) with a check for $25,000 to support the work of Catholic Social Services' Food Cupboard in Montgomery County. From left: Amy Stoner, CSS director of Community-Based Services; Jeanne Raubenstine; Clair Raubenstine; Archbishop Chaput; George Gunning IV; John Hoy; Karen Burgio Hoy; and Liz Peteraf, administrator of CSS Montgomery County Family Service Center. Montgomery County residents line up to receive food at the CSS Food Cupboard in Norristown. Members of the Order of Malta gave a $25,000 check last month to Archbishop Charles Chaput for the purchase of refrigerators and freezers for the Catholic Social Services-run Montgomery County Food Cupboard in Norristown. 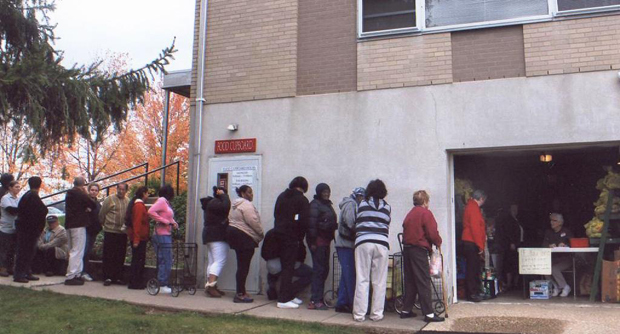 The Food Cupboard fed more than 35,000 people from nearly 10,000 households from throughout Montgomery County in 2014. The new commercial grade appliances will help to expand the cupboard’s food storage capacity. A group of the Order of Malta’s Federal Association in Philadelphia meets every month at the Food Cupboard and helps to stock shelves and reorganize food for visits by clients in the following week. Clair Raubenstine, coordinator of the Federal Association, and his wife Jeanne (also a member of the order) began the project and identified the Food Cupboard as a “hands-on” local service project for members of the order. The Food Cupboard serves veterans, the elderly, the working poor and immigrant families who aren’t able to meet their monthly food needs without the program’s vital assistance. “The Food Cupboard’s program does great work on a small budget, so funds for this equipment will enable it to better serve its clients,” said Hoy. His wife Karen, also member of the order, was instrumental in writing and presenting the grant request. 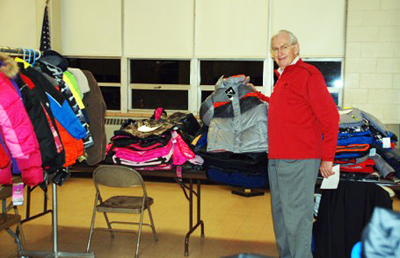 At a Dec. 16 Christmas party for 180 guests at the CSS Montgomery County Family Services Center in Norristown, coats and winter wear donated by the Our Lady of Good Counsel Knights of Columbus Council 15658 were distributed to needy families. Liz Peteraf, administrator of Catholic Social Services’ Family Service Center in Montgomery County, recognizes what the donation will enable her to do. Peteraf is grateful for the service commitment of the local members of the Order of Malta, who are among more than 50 dedicated monthly volunteers who together account for nearly 500 volunteer hours a month. The CSS Food Cupboard in Norristown helps local grocers to donate their overstock meat and produce, and in turn distributes over 30,000 pounds of food each month in the community. The Order of Malta is an international Catholic lay religious order founded in the Holy Land in the 11th century, whose mission is the defense of the faith and assistance to the poor and suffering, through the voluntary work carried out by the Knights and Dames of the Order. With international headquarters in Rome, the order operates a maternity hospital in Bethlehem, Palestine, and provides humanitarian assistance in the form of medical, food and disaster relief services around the world. More than 900 U.S. Catholic men and women are members of the Order’s Federal Association, founded in 1974 in Washington, D.C.